If you’re an entrepreneur living in a concentrated area with more than 135,000 licensed dogs and 1.2 cats for every dog, and you’re not a veterinarian, you might just start thinking about developing a business that catered to pet owners. That’s what an Alexandrian, VA resident did recently who lives just inside the Washington, DC beltway. Paul Ozner and his partners seized the opportunity when they realized that the “Uber” transport model could easily be adapted for transporting pets to and from appointments at the vets, grooming shops and even for a pet-date with another furry, four-legged friend. So ‘Rapid Paws’ was born . . . While long-distance transport services for pets have been around for some time, Rapid Paws is filling the void of short-distance trips. By downloading their smartphone app or going on its Web site, customers can schedule a door-to-door pickup and local delivery of their cat or dog within a two-hour window. There’s even an onboard PAWCAM in the company’s vans ,so that a pet owner can keep an eye on Rover or Buttons during the transport. Paul OznerThe Rapid Paws rates are reasonable considering the service may be providing pet owners an opportunity to do other things, due to time constraints. There are also many cases where seniors or people with disabilities subscribe to the service, because they don’t have access to any cars. For example, according to Washington Post feature, Myra Arnold of Arlington,VA enlisted Rapid Paws to run her dog King to the beauty shop. King — a champagne-colored, royal standard poodle, weighing in at around 80 pounds – is a service animal trained to attend to her because she has diabetes. The fare was $25. 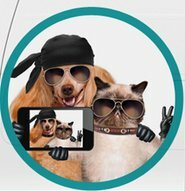 Rapid Paws state-of-the-art reservations system taps into 4000 operators and is accessible by broadband, wireless, mobile and voice. Their vehicles are completely climate controlled with supplemental HVAC and stand-by power generation. Based on their early success, it looks like Rapid Paws might need to look into franchising their operation, so that other folks outside the beltway and throughout the country can also have a quick and easy means of transporting their pets around their respective towns. The Eight-Armed Escape Artist -- Squishy Animal Video of the Day!!! !